WORX® has introduced a new cordless circular saw with an innovative feature that’s not available on any saw in the marketplace. The WORX 20V 6-1/2 in. Circular Saw with ExacTrack™ takes the guess work out of straight line cutting by incorporating a tracking guide that enables accurate rip cuts. A cordless drill and a portable circular saw are tool box essentials. A cordless drill is indispensable when it comes to drilling holes and driving screws, while a portable circular saw is ideal for cutting wood. The basic functions of a circular saw are making crosscuts, cutting wood against the grain at 90° and straight line cutting or ripping a board lengthwise with the grain. Making accurate rip cuts in dimensional lumber, such as a 4x8 sheet of plywood can be challenging. Most circular saws come with an edge guide, but more and more saw owners are shifting to the use of track saw guide accessories to ensure accurate rip cuts. Track saw guide accessories typically run from $40 to $80. 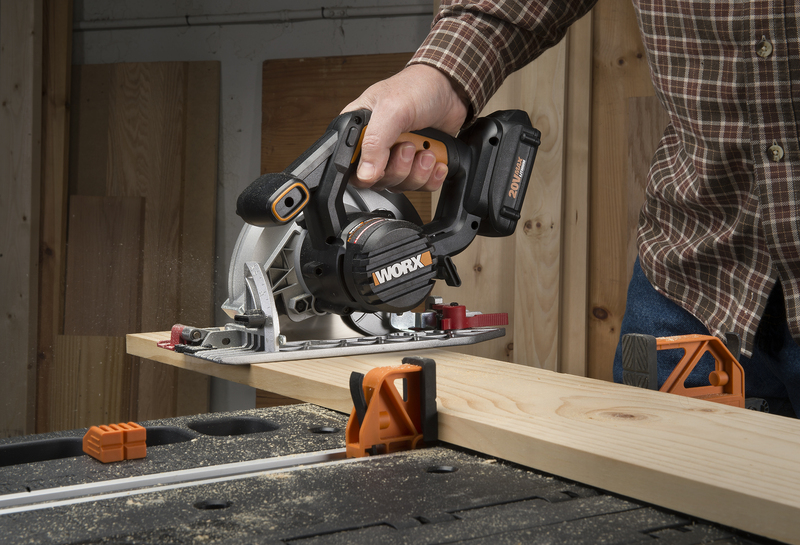 What makes WORX ExacTrack different is that it’s the only circular saw with a built-in track guide. To rip a sheet of plywood with ExacTrack, simply clamp 1x material to the desired width and mark the cut line. The 1x stock also functions like a fence on a table saw. Begin the cut with ExacTrack gliding right on top of the 1x stock for the duration of the cut. This makes long rip cuts easy for all skill levels. When not set for ripping, ExacTrack is returned to its standard position for cross-cuts and other cutting operations. Weighing 6 lbs., the WORX 20V 6-1/2 in. 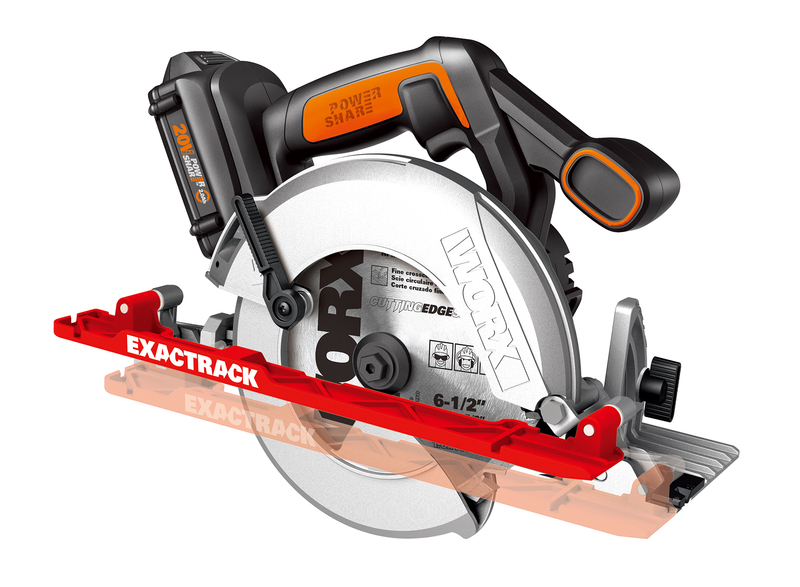 Circular Saw with ExacTrack is compact and lightweight. The saw is powered by a 20V 2.0 Ah Power Share™ Max lithium battery and 3600 rpm (no-load) motor. The saw’s maximum depth of cut is 2 in. and bevel capacity is up to 50°. The saw is ideal for DIY projects and remodeling jobs. The 6-1/2 in. 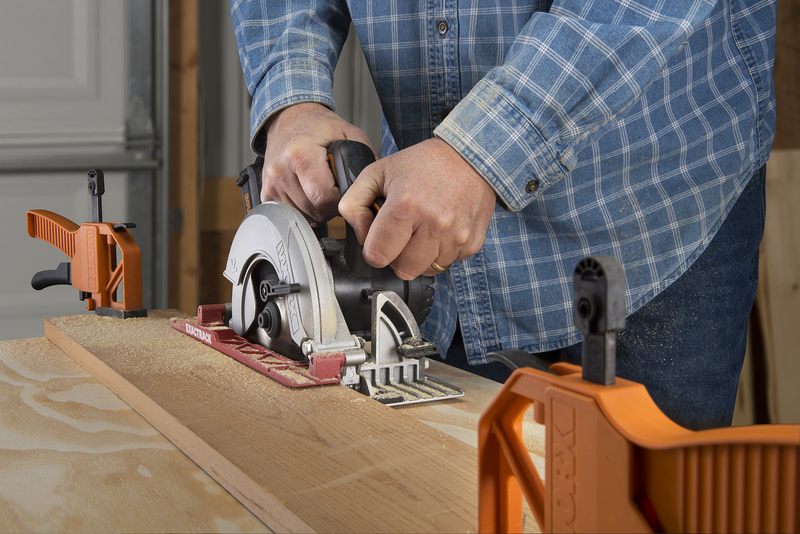 circular saw features a rubber overmold comfort grip and a spindle lock for fast and convenient blade changes. As part of the WORX Power Share program the 20V 2.0 Ah battery is compatible with more than two dozen WORX DIY and lawn and garden tools. In addition to the saw, the kit includes one, 20V 2.0 Ah battery, a 3-5 hour charger, and a 24-tooth, carbide-tipped saw blade. The saw is covered by the WORX three-year warranty. The WORX® 20V 6-1/2 in. Circular Saw with ExacTrack (WX530L, $119.99) is available at worx.com and Amazon (April).